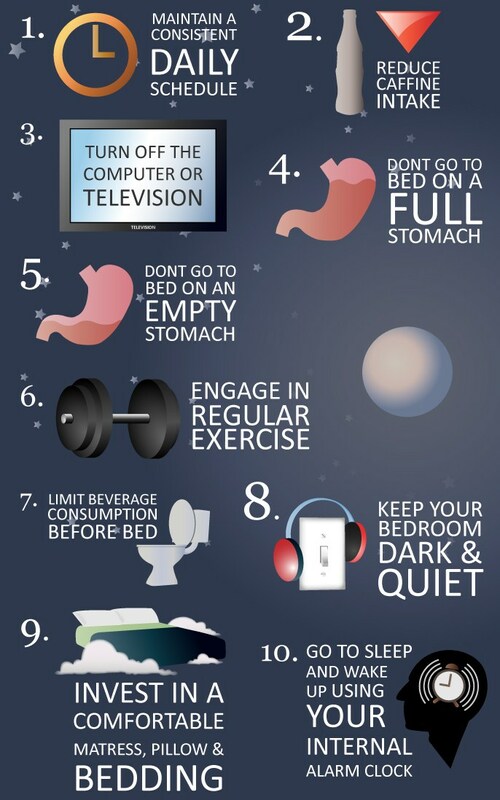 Are You Looking For A Better Night Sleep? 1. Make and Follow a Daily Schedule. Humans are creatures of habit. We have internal clocks, checks and balances. When your work day is helter skelter or your time at home after work is one continuous merry-go-round, your system does not have time to adjust to your schedule. It is like jet lag. You fly across the country and just because it is 11:00 pm at home, it may be 7:00 pm in your new location. It will take you several days to adjust to the time change. If you do not have a regular schedule in your normal daily life, your internal clock does not have a chance to regulate itself. 2. Drink 6-8 Cups of Water Per Day. While some may feel that their bodies are made up of mostly fat, the fact is that our bodies are made up of 90% water. If you are not hydrating properly or enough, your internal organs as well as your brain cannot function at 100%. Your water intake should take place at intervals throughout the day. The first week your body may take time adjusting but in the end you will feel so much better. Don’t even think about drinking it all before bedtime or you will be up all night. Many soft drinks as well as most of the high energy drinks you see advertised have an immense amount of caffeine in them. Caffeine is a stimulant. A stimulant plus sleep do not go hand-in-hand. Unfortunately we hear of so many celebrities who have died from a combination of uppers to help them through a show and then they take sleeping pills to come down from the upper. It is just a matter of common sense. If you are a caffeine addict, try drinking decaffeinated coffee, tea and soft drinks after 3:00 pm. While timing can differ depending on an individual’s body and metabolism, experts say it can take as long as six hours before caffeine has left your body. If you do not consume any after 3:00 pm, you should be caffeine-free by 9:00 pm. 4. Turn Off The Computer or TV 2 Hours Before Bed. This one is really common sense, but some people just do not realize that even though they may turn off an electronic device, the brain has not had the opportunity to go into rest mode. Brains are wonderful, magical things. They keep on working long after you think they are shut down for the day. Sometimes this is why you have such bizarre dreams. Brains are like computers – garbage in and garbage out. Try putting something good in your brain cells prior to bedtime. Read a book. If you are a religious person, pray. One good trick is to lie in bed and begin relaxing every muscle in your body beginning with your toes. By the time you work your way up to your head, your brain will have gotten the message that you are relaxing. 5. Don’t Go To Bed on a Full Stomach. Eat Dinner 3-4 Hours Prior To Bed Time. One of the main reasons for this tip is that it takes quite a bit of time for food to be digested. It needs time to travel down through the digestive tract. If you eat something prior to retiring for the evening you could wind up with a common case of acid indigestion. You may not think this is a big deal while you chew on your antacids, but the digestive acids that come up in your esophagus can lead to damage to the lining. This can happen even with a small snack before going to bed. Remember the last time you had a bowl of chocolate ice cream before bed? You got it in deuces. The chocolate is full of caffeine plus you got acid indigestion, too. 6. Exercise On A Regular Basis – at least twice a week. Have you ever heard of ‘runner’s high’? Do you see the same people walking in the neighborhood evening after evening? Regular exercise is as good as a tranquilizer because it releases endorphins which are chemicals that make you feel happy and full of good health and vitality. It may seem converse, but the more vitality you have and the better you feel, the better all of your internal systems will work. Think about this as well. When you go to bed sad or worried, you just lie there and dwell on your problems. If you go to bed happy, you have no worries. 7. Do Not Drink Water Before Bed. This falls into the same category as all the times your mother told you not to eat watermelon before going to bed. Some people have what seems like bladders that can hold a gallon of water until waking in the morning. The rest of us humans do not. It gets even worse as you age. Drinking water prior to going to bed will mean you will wake up several times during the night to go to the bathroom. You will never get a complete seven or eight hour sleep. A full night’s sleep is the time that our bodies use to heal and repair the damage we have done during our waking hours. 8. Keep Your Bedroom Quiet – turn your cell phone to silent. You just cannot get your brain to shut down when there is noise. Your brain has to assimilate what the noise is – is it danger? Then you have the ‘fight or flight’ response where adrenaline will flood your body. You absolutely cannot fall asleep when you are pumped on adrenaline. And the cell phone? Not everyone was raised with manners that dictated that you do not call a person after 9:00 pm unless it is an emergency. The call can go to voice mail and you can retrieve it in the morning. Naturally, if you are an emergency responder or medical personnel, this tip does not count – except for the peaceful sleeping arrangements. 9. Invest In A Comfortable Mattress, Pillow and Bedding. Even the most macho of cowboys had a tough time falling asleep and staying asleep when they slept on the ground with their saddles as their pillows. A sagging mattress or one that has springs hitting you in the back will keep you from getting to sleep. The wrong pillow for your particular neck and head will leave you punching it over and over until you pulverize it into a comfortable shape. And who can fall asleep on scratchy sheets? When you are ready for bed and ready to sleep, there is nothing more restful and comforting than good bedding. It is like you have landed on a cloud. No cheating. Do not hit the snooze button. Rather, your feet must hit the floor. What this does is also set your internal clock. You have heard of individuals who have worked at a certain job for many years that do not even need alarm clocks. That is because their inner workings are so accustomed to when they go so sleep and when they wake up. After a while you may even wake a few minutes before the alarm. The human body likes a structured schedule. It functions better and with more precision. Even if you went to that ballgame, do not change the alarm. Notice how quickly you fall asleep that evening.